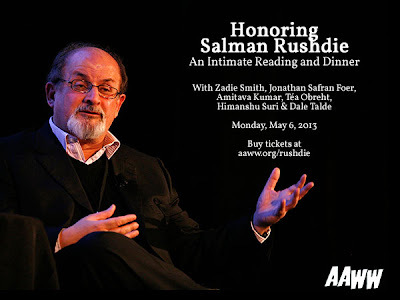 Believe me, if I were in New York City on May 6th, I'd be at this event. The Asian American Writer's Workshop is inviting us to honor Salman Rushdie at Tribeca Cinemas, and to sweeten the deal, they've added a fabulous lineup of other guests: Zadie Smith, Jonathan Safran Foer, Téa Obreht, Amitava Kumar, Himanshu Suri (formerly of Das Racist) and Top Chef competitor Dale Talde. Get tickets and/or find out more here.